Danielle Lella Bartolone is a Masters candidate in geography at Hunter College who just recently graduated with her B.A in geography. This year Bartolone was one of two recipients to receive the Society of Woman Geographers Fellowship at Hunter College. With this award she has begun working on her thesis which has taken her to new places where she is conducting a survey to further her research. What does geography mean to you? As a cultural geographer I am interested in understanding how the beliefs, explanations, perceptions, and values of vedic culture help the people of Govardhan Ecovillage (GEV) make sense of their world and how this cultural substructure constricts or enables sustainability. My current research is how sustainability or unsustainability is embedded in culture. The central claim of my research is that current global systemic crises emanate from a modern western cultural worldview that is premised on the separation of humans and nature, the disconnection of humans with humans, and the promotion of perpetual economic growth for human development and wellbeing. Ecovillages hold a wealth of knowledge into sustainability because they are living models of alternative systems of culture, offering rich insight into how to transition from a culture of unsustainability to sustainability. Tell me about the fieldwork you are conducting. 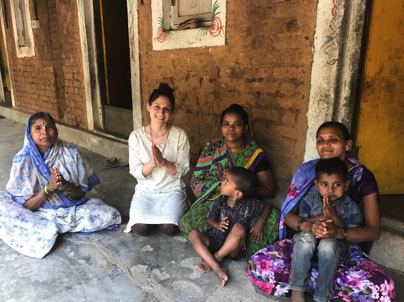 I’ve traveled to Maharashtra, India for a case study on Govardhan Ecovillage, a model sustainable community and spiritual retreat center, to investigate how vedic culture (ancient religious practice of India) can lead to holistic sustainability. While there I’ve interviewed 30 ecovillage residents, management, and participant observation, to discover how the worldview and principles of vedic culture is the essential foundation and structure for the community in realizing sustainability. Why is a geographic approach so important to your research? I believe it is significant for geographers to study cultural landscapes and/or geographic area on either large or small scales that have been affected, influenced, or shaped by human societies. As well as observing how the environment impacts the people who live in the areas being studied. This interaction is essential to examine in order to better understand the global crisis we find ourselves in and identify pathways out of it.